Marketing is undergoing rapid and major changes. We’re moving away from mass, “push”-based marketing, and towards more personalized, 1:1 communication with consumers, through the many channels and on the many devices they use. The effectiveness and ROAS (return on ad spend) of print media, television ads, and batch and blast email campaigns are on the decline. 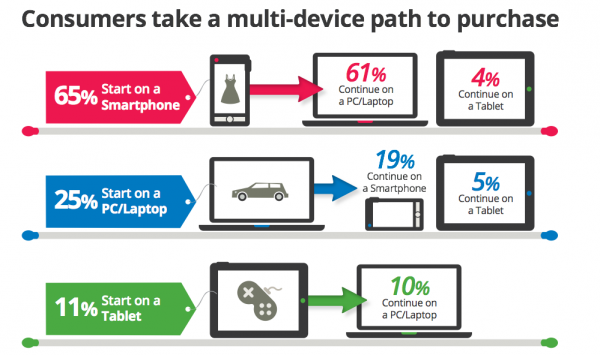 Unfortunately, when it comes to omni-channel, multi-device marketing, consumers today are way ahead of most marketers. 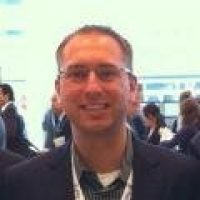 First of all, what is omni-channel marketing? The term “omni-channel” may be a marketing buzzword, but it refers to a significant shift: marketers now need to provide a seamless experience, regardless of channel or device. Consumers can now engage with a company in a physical store, on an online website or mobile app, through a catalog, or through social media. They can access products and services by calling a company on the phone, by using an app on their mobile smartphone, or with a tablet, a laptop, or a desktop computer. Each piece of the consumer’s experience should be consistent and complementary. Read more about how marketers are connecting with consumers in an omni-channel world in the Marketing Trend Watch: 2014 Planning Edition. Regularly review the experience your customers go through in order to research, purchase, and connect with your products. Test the experience by placing orders, interacting via all available channels, submitting a support case, and more. If possible, these tests should be performed by external and internal testers. Does everyone have a delightful experience? Are there any unnecessary barriers? Understand which data points are useful to you, and segment your audience accordingly. Which data points actually help you better understand your audience? Using marketing automation, you can capture this information to build very rich profiles about your customers and the customer journey – you can even partner with companies like Acxiom or DSPs to enhance your data with more intelligence. This kind of rich data can be translated into customer use cases, and also used to build buyer personas. For example, male iOS users who work in the tech industry and are between the ages of 25 and 35 are more likely to buy based on technical specifications. If you discover you are marketing to that audience, you might highlight technical specs in your landing pages and nurturing strategy. Content and messaging is key. If a customer has previously engaged or purchased your product, you probably want to consider that in your marketing. If a customer has put something into a cart, but hasn’t yet purchased, use your content to reference that intent. In my sixth recommendation, I discuss the great content that Zappos creates to address use cases. 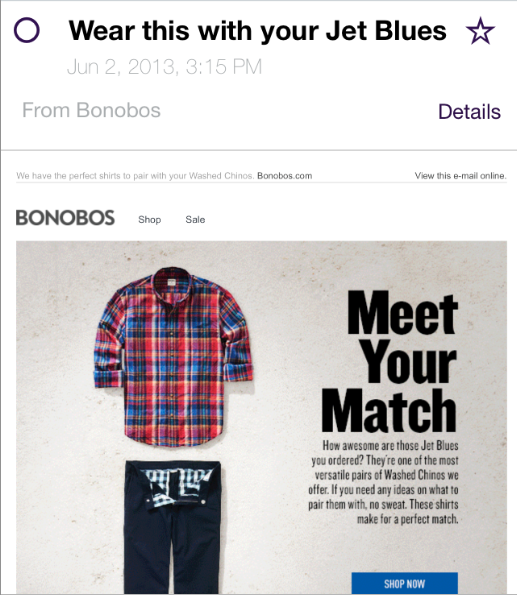 I’ve also received emails from Bonobos referencing previous purchases, and recommending complementary products. This type of content and messaging makes consumers feel personally spoken to, and helps drive much higher engagement, loyalty, and purchases. Increasingly, people use multiple devices during a single transactional process. Make sure that you are able to listen and respond to these interactions. For example, an e-commerce retailer should strive to preserve items in a cart across devices – if you add an item to your mobile shopping cart, it should still be in your shopping cart when you log in on your desktop computer. Recently, I added a pair of shoes from Zappos to my shopping cart, using my mobile phone. Later, I viewed the same shoes on my laptop at home, but didn’t purchase. Finally, on a weekend afternoon, I got an email from Zappos with the subject line “You snooze, You Lose”. Inside the email, the big bold header said “Don’t miss out!” There was an image of my shopping cart, the shoes, and a bright orange tag that said “Only 1 LEFT!” Needless to say, I bought the last pair of shoes. Zappos had just made my buying experience as easy as taking candy from a baby. Even though I’ve quoted several mega-brands, platforms like Marketo make these approaches accessible to companies of all sizes. There’s too much at stake in your business to delay taking that first step any longer. Consumers may be ahead of many marketers now, but this soon won’t be the case. Those marketers who thrive will be the ones who can deliver on the promise of a personal, omni-channel experience. Learn how skilled marketers are creating exceptional high touch experiences with the Marketing Trend Watch: 2014 Planning Edition.